If you are using metered internet service either through an official Personal Wi-Fi Hotspot service, a jailbroken iPhone WiFi hotspot, or a local cable or telecom monopoly that’s imposing bandwidth caps and limits on your internet access, or any other bandwidth restricted service, you’ll probably want to keep an eye on your bandwidth consumption so that you know where you are and when you may hit your limit. 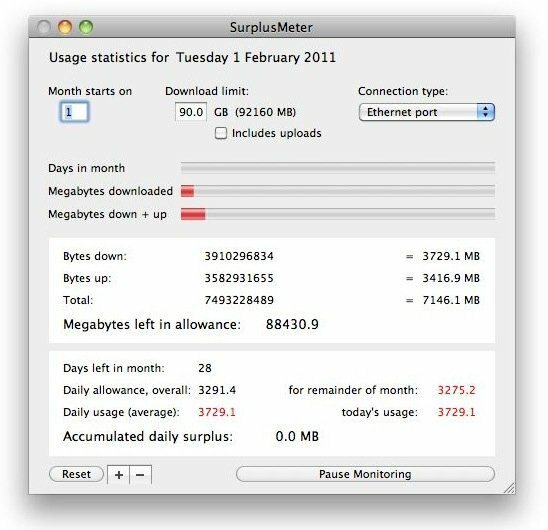 We’re going to show you how you can watch your bandwidth in Mac OS X for free by using an app called SurplusMeter. After all your settings are squared away, SurplusMeter will start to monitor all up and down network traffic from your Mac. You may notice a “SurplusMeterAgent” running in Activity Monitor’s task manager too, that’s normal and launches automatically on system boot. The main problem I see with SurplusMeter is that it doesn’t seem to differentiate between local network and internet traffic. If you transfer large amounts of data from your Mac to something else like a media center or Apple TV, you may need to manually tweak the bandwidth use or ‘pause’ SurplusMeter during large LAN file transfers. You can also get this kind of data from most routers, but for most people it’s not as user friendly. So SurplusMeter isn’t perfect and it’s a little outdated, but it does work fine in Mac OS X 10.6.6, and it’s free so how much can we complain? It would be great if the developer updated it a bit and then submitted for the Mac App Store, there’s clearly an audience for this kind of tool now. I would say this app is absolutely essential for any Mac user that is faced with a bandwidth cap. Thanks to MacGasm for finding this utility. Well in theory yes.. but if you like me use airplay (or itunes remote speaker) then your usage will look alot higher than it is sine that is counted as usage by surplus meter also. it can not discriminate between were the data go over your wifi, to internet, or to somewere on your own network… so for all that use airplay apple tv, remote speakers, NAS, or sharing on local network.. it has no pratical use, what so ever. I’ll use this for the time being but I am still searching for a more accurate solution that doesn’t count LAN traffic. Please let us know if you find something suitable with more options and WAN only. well you cant conneckt your +apple tv nas via etherhet and your internet wia wifi, and use both at the same time… also even if you could, what would the point be of having wifi, if you still had to use a cabel ? How can one determine bandwidth use per client machine using Time Capsule (Airport) as a router? If you want to save your network use ProteMac Meter – monitoring all your activity. Has OsX discovered a tool, that solves the limitation of this tool – its now march 2012? cause, i did not realise this, and been freaking for months, and stop DL cause i thought i was at limit…. Not working on my Mountain Lion, 10.8.2. Anyone know of a bug fix? Maybe this is a dumb question. Does the SurplusMeter application itself need to be running for it to monitor usage? Or, once it’s run, will the SurplusMeterAgent continue to run and monitor traffic? Installed it today and have been watching it for a few hours. Seems to work OK. My biggest gripe is that you can’t change the measurement units. I have 1 TB of bandwidth with my plan, so expressing everything in megabytes is a bit annoying. Kind of like telling you my weight in milligrams.